Need to ensure all your staff have read a message? Just issue an alert. Your workforce has to acknowledge that they've read the message to access the site. You get a full report detailing when each staff member read the message and how long for. At the click of a button see the contact details of those who have not signed yet so you can get your list completed fast. Record staff acknowledgements of important information such as policy or legal changes. As them confirmation questions and export the results to CSV as proof. Need extra shifts filling? StaffSavvy allows you to email your staff not working on a particular day. It's two clicks. Need to email the team working too? No problem; that option is also right there at your fingertips. SMS is also available at a cost per message. On top of this direct message, you can post news items that are delivered to your staff inbox and shown on the site for as long as needed. Never forget to record lateness again. 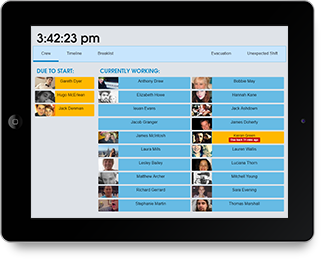 With our web-based clock in screens, we know when staff are early or late. After a grace period, we automatically flag their shift as late. You can edit this anytime and run full reports to see if there are any repeating problems. Levels allow you to grant different powers to different members of staff. Need a certain duty manager to review timesheets? Just create a new level and assign your staff member to it. Complete and bespoke control when you need it. As this is a bespoke and advanced feature, we'll setup any level you need as part of our support. Our system also allows for an ultimate power; to take control of a staff member's account. This allows you to make any changes you need to any account. Never have staff say they're not available after you have planned your rota. Using StaffSavvy's simple availability planner, they can pick and choose the hours they are available during the week. Managers can set hours they must be available - those particularly busy periods - and you can limit the number of hours they can reserve during the week.